Who Farms in the United States? Chickens at a modern factory farm. More and more chickens and hogs are being raised on large-scale farms called "factory farms." Those who say that this type of farming is cruel to the animals and very harmful to the environment use the term. On these farms, overcrowding of animals is common and animal waste runoff is blamed for contaminating rivers, streams and groundwater. 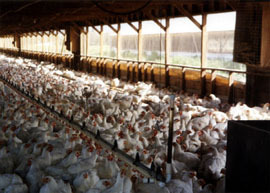 Click on PICTURES below to see an additional photo of chickens at a modern factory farm.